When [::vtol::] wants to generate random numbers he doesn’t simply type rand() into his Arduino IDE, no, he builds a piece of art. It all starts with a knob, presumably connected to a potentiometer, which sets a frequency. 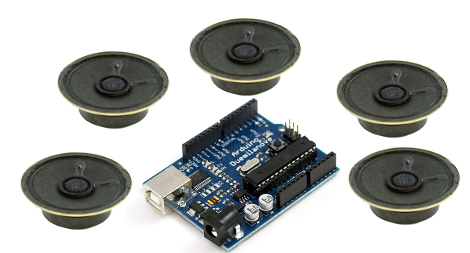 An Arduino UNO takes the reading and generates a tone for an upward-facing speaker. A tiny ball bounces on that speaker where it occasionally collides with a piezoelectric element. The intervals between collisions become our sufficiently random number. The generated number travels up the Rube Goldberg-esque machine to an LCD mounted at the top where a word, corresponding to our generated number, is displayed. As long as the button is held, a tone will continue to sound and words will be generated so poetry pours forth. If this take on beat poetry doesn’t suit you, the construction of the Ball-O-Bol has an aesthetic quality that’s eye-catching, whereas projects like his Tape-Head Robot That Listens to the Floor and 8-Bit Digital Photo Gun showed the electronic guts front and center with their own appeal. When you take a microcontroller class in university, one of the early labs they have you drudge through on your way to, promised, mastery over all things embedded, is a tiny music generator. It’s a more challenging lab than one would expect. It takes understanding the clock of the microcontroller and its sometimes temperamental nature. It takes a clear mental picture of interrupts, and is likely one of the first experiences a burgeoning designer will have worrying about the execution time of one of their loops. Also tables, data structures, and more. It even requires them to go out of their comfort zone a learn about an unrelated field, a challenge often faced in practicing engineering. Luckily [Łukasz Podkalicki] has done a great job of documenting the adventure. He’s got everything from the schematic and code to the PWM traces on the oscilloscope. It’s also worth mentioning that he’s got a few other really nice tutorials for the ATtiny13 microcontroller on his blog. A tiny party light generator and a IR receiver among them. Because the Arduino is in such high demand for producing multiple musical tones at the same time; [Jeremy Blum] has successfully figured out the math and other necessaries that will take your once previously single tone producing MCU and turn it into a 5 tone producing machine. unsurprisingly its really just some creative use of PWM control but it all works out in the end anyway and helps prevent you from purchasing additional sound generating chips. This truly does open up some new doors, as [Jeremy] shows with his still in production thingamakit like project: ReacXion.